Aroma Espresso is now Antica Tradizione. New shape, new look, same great taste! < The best selling product in the Kimbo line, this blend is realized using mainly Brazilian coffees that come together to create a perfect balance between flavor and aroma. 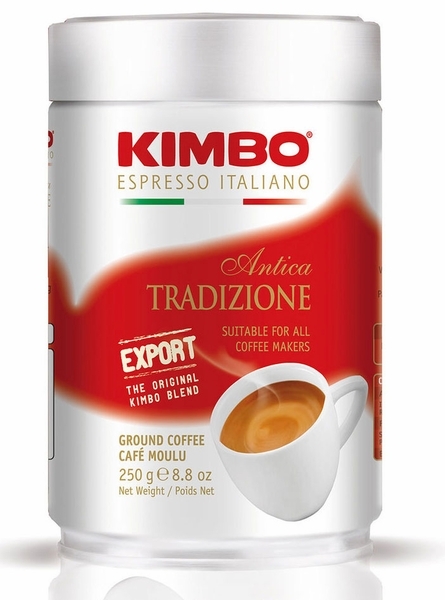 Kimbo manufactures some of the finest coffee ground ever, and this is best selling product in the Kimbo line. This blend is made using mainly Brazilian coffees that when mixed, make a coffee that is perfectly balanced between aroma and flavor. This is MADE IN NAPLES (NAPOLI). Sold by the case, and there are twelve 8.5 oz (250 gr) cans per case. The best coffee in the world. Thi is the only coffee I drink, I would never change my kimbo for any other coffee. I can say I have grown up drinking Kimbo Caffe and I am still crazy about it, as well as all my family. Rich espresso flavor and taste. If you never tried Kimbo, try it if you have a chance. The best coffee in the world,the very best. Saint Marys, Georgia.